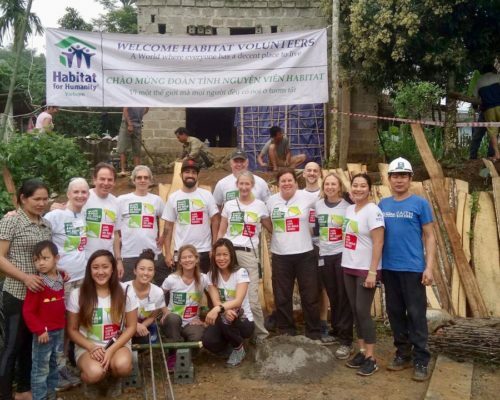 From March 16th to 23rd, 2018, a team of 28 volunteers from Habitat for Humanity Greater San Francisco traveled from the Bay Area to Vietnam to help build two homes through the Global Village program. Before the Build Week began, the group of volunteers first flew into Hanoi to experience all the rich cultural activities, famous landmarks, and delicious food that the capital city of Vietnam offers. The next day, the volunteers headed to their final destination: Hòa Bình. Just 55 miles south of Hanoi, Hòa Bình is a mountainous, rural province in the nation’s northwest region. For four straight days, the volunteers worked alongside skilled local construction workers, Habitat homeowners, their family, and their neighbors. Together, they transported building materials, filled foundations with dirt stone and sand, compacted floor, mixed mortar, laid bricks, and cleaned and painted windows and doors. By the fourth and final build day, they had two completed homes ready for two new Habitat homeowners to move in. After the final day of construction, home dedication ceremonies were held for the two new Habitat homeowners. Afterwards, the volunteers gathered for a celebratory lunch with Habitat families, community workers, and Habitat Vietnam staff to commemorate this special weeklong experience of building homes, building new friendships with local people, and building understanding and connection to the beautiful country of Vietnam. “You really feel like a part of the local community when you’re on a Global Village trip. The local people graciously welcomed us and made us feel at home. To know that I made some lasting impact by volunteering and building homes for the local families is a feeling I can’t even begin to describe,” said one Global Village volunteer. Since 2010, Habitat Greater San Francisco has partnered with Habitat Vietnam and send a delegation each year to build homes and advocate for better housing and homeownership opportunities. 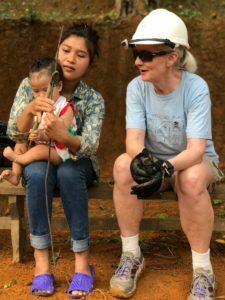 As the affiliate’s seventh trip to the country, this trip was a great opportunity to reconnect with old friends, build homes for local families, and help address the housing need in Vietnam. Over 10% of Vietnam’s population of 90 million live below the national poverty line. Hòa Bình is one of the poorest mountainous provinces in northwest Vietnam. Eighty-five percent of the population live mostly on agriculture and animal husbandry, and suffer from frequent landslides and severe cold weather, which causes death of livestock and destroys houses and crops. 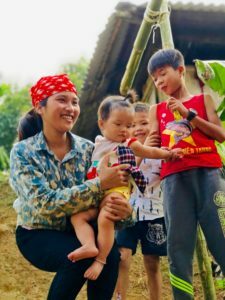 Although Hòa Bình has received support from more than 40 international development organizations such as ChildFund, World Vision, and Action Aid, their activities have mainly concentrated on livelihood, health care, education, and water/sanitation. None address the need for housing improvement.